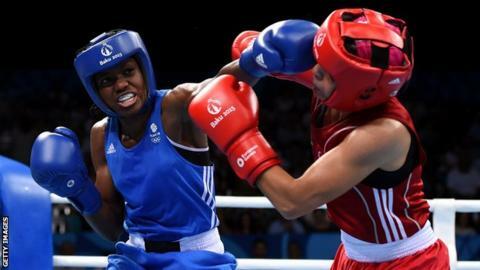 Nicola Adams says she is aiming for a unique treble of titles ahead of the European Olympic qualifiers in Samsun, Turkey. "I want to qualify at the Europeans next week," Adams told BBC Sport. "To think that I could be European, world and Olympic champion in the same year is absolutely epic. "It's that little piece of history that is my motivation." The tournament begins on Saturday, with Great Britain sending 13 athletes. There are 36 qualification places for the 2016 Olympics in Rio de Janeiro available - 30 for men and six for women. Female boxers who miss out have a second chance to qualify at the World Championships in Astana, Kazakhstan in May. "I want to do it first time round, I don't want to mess about," Adams added. Men: Galal Yafai, Muhammad Ali, Qais Ashfaq, Joe Cordina, Pat McCormack, Cyrus Pattinson, Antony Fowler, Joshua Buatsi, Lawrence Okolie, Joe Joyce. Women: Nicola Adams, Chantelle Cameron, Savannah Marshall.